Georgian Roped Back Plate Entryway Set (Polished Brass Finish) - comes complete with the mounting hardware. This Georgian style roping originated with Elsley twisted rope plates c. 1880. Also available in polished brass (shown), antique brass, brushed nickel and oil rubbed bronze. Multiple sets can also be keyed alike upon request. Comes with a standard 2 3/8 inch backset and a 2 3/4 inch backset is available as an option. 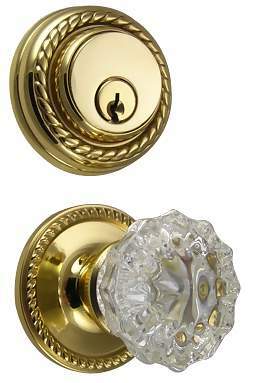 Single Entryway doors use the deadbolt system shown - double doors need a double sided dummy set for the second door.